Procrastination means to put something off intentionally and habitually. Are you a procrastinator? Could that be the reason you feel stuck? Or the reason you’re rotating in circles and can’t seem to reach your goals? We all have goals, hopes, and dreams. If you stopped 10 random people on the street today and asked them what they desire in their lives and where they’d like to see themselves in 5–10 years, they would have an immediate answer for you. Problem is, even though we mostly know what we’d like to achieve and see happen in our lives, we don’t always work toward making that happen. There are many reasons for this. Aside from the obvious constraints—work, kids, school, just too busy—I’ll focus on two. These are our two biggest reasons for procrastination. Most of us believe we don’t have enough time. Of course, this is true sometimes, and during busy phases of our lives, we just don’t have enough time. However, for the most part, we do have ample time to do everything we need to do, if only we would just…prioritize! Yes, prioritize. 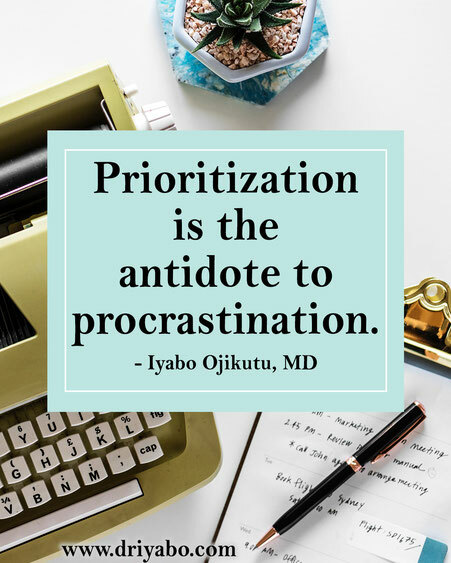 Prioritization is the antidote to procrastination. There are 24 hours in a day! Sleep is a must—at least eight hours. Sixteen left! Exercise/physical activity one hour. Work, maybe an average of eight to nine hours. Still left with six or seven! Wow! If you cooked and/or spent time with your family for three hours, you still have four or so hours left. Imagine what you could achieve in four hoursif you practiced or worked on it every day or most days of the week! You could write a book in two months, open a new business, learn a new craft, take online classes for a first or new degree, volunteer for a cause dear to your heart. You can achieve a lot in four hours! Problem is, we don’t prioritize. We squander our time knowingly and unknowingly on things that don’t directly serve our goals—social media, watching TV, worrying, daydreaming—events that don’t grow us or help us evolve. Nothing wrong with social media, but use it sparingly and intentionally to help reach your goals. Worry is a waste of time. 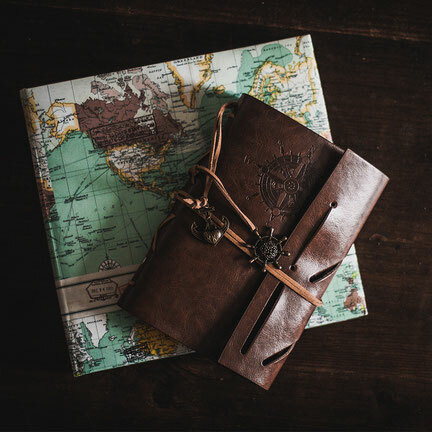 Instead, pick up your journal and write down your feelings, hopes, solutions, and action steps. If you don’t have a solution for something, pray about it, believe your prayer will be answered, and then let it go. Daydreaming is OK if it’s positive, enlightening, warming to your heart, bringing a smile to your face, and being used sparingly. Social events—of course, we must go out and enjoy quality time with friends and family, but being a social butterfly with no limitations is a waste of time and can be suicidal to achieving our dreams. 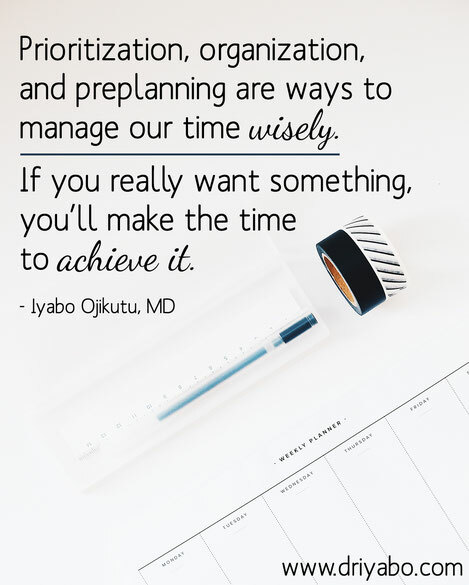 Prioritization, organization, and preplanning are ways to manage our time wisely. If you really want something, you’ll make the time to achieve it. Fear. A huge one. The one we never want to admit is our biggest reason for procrastination. being too old—how can I start this at 45?! The list is endless. Too many fears limit our hopes and dreams from being fulfilled. If you really want to achieve your goal, you must let go of your fears. There is no other way. Time and fear lead to procrastination. Procrastination will then kill your hopes and dreams. Would you rather know you did try at 48 years old, put in all you could to make that dream come true, than to wake up one day when you’re 75 years old and have major regrets? Don’t be that person walking around with regret and eventually resentment of others because you procrastinated for so long. Put away procrastination for good today. Open the window and chuck it out! Write your goals, hopes, and dreams down clearly. Visualize yourself celebrating that goal one day soon. Write down action steps needed to start and to maintain the process to full fulfillment. Prioritize your time—break down the 24 hours Sunday to Saturday. Look for three mentors or advisers or experts in the field of your goals. Seek out their help. Remember to enjoy the journey to your goal realization. Enjoying the journey is as important as celebrating the goal. May we all be permanently happy by notprocrastinating or giving up.